Paul Bocuse, 'Giant' Of French Cuisine, Dies At 91 : The Two-Way The French president and several celebrity chefs mourned the loss of a man who helped re-imagine French cuisine. French chef Paul Bocuse, who helped invent a style of cuisine, died on Saturday at his home in France. The French president said chefs were crying across the nation. Paul Bocuse, whom the French president called "the epitome of French cuisine," died Saturday at the age of 91. "Today French gastronomy is losing a mythical figure that profoundly transformed it," the Élysée said. Bocuse's family announced his death in a statement: "Much more than a father and a husband, he is a man of heart, a spiritual father, an emblematic figure of world gastronomy, and a tri-colored standard bearer." The celebrity chef and restaurateur, who built an empire worth more than $60 million, died in his sleep at his home in Collonges-au-Mont-d'or, the place of his birth, reports French newspaper Le Monde. As a rising chef in the 1960s and '70s, Bocuse was associated with France's so-called nouvelle cuisine, moving the popular palette away from classic fare steeped in heavy sauces toward lighter dishes elevated by regional ingredients. As his renown grew, so too did his network of restaurants, extending outside France to Switzerland, the United States and Japan. Bocuse also operated a culinary school in France and authored several cookbooks. And well before the social media age, Bocuse managed to master the art of self-promotion. The New York Times reports he was "a constant presence in the news media and on television." In 1987 he founded the international cooking competition the Bocuse d'Or, which has come to be known as the Olympics of the culinary world. Last year, a U.S. team won gold for the first time in the contest's 30-year history. Bocuse told People Magazine in 1976, "God is already famous, but that doesn't stop the preacher from ringing the church bells every morning." On Saturday, the accolades rang out for the Frenchman. President Emmanuel Macron tweeted Saturday, "Paul Bocuse is no longer here. Chefs are crying in their kitchen at the Élysée and everywhere in France." But Bocuse, one of the first chefs to whip up fame from culinary prowess, was mourned by fellow celebrity chefs outside France as well. Tom Colicchio of Top Chef said "Chef Bocuse was the giant (whose) shoulders we all stood on." British chef and T.V. personality James Martin called him "the greatest of them all." "The world looks a little dimmer today," said Andrew Zimmern, who hosts the Travel Channel's Bizarre Foods with Andrew Zimern. 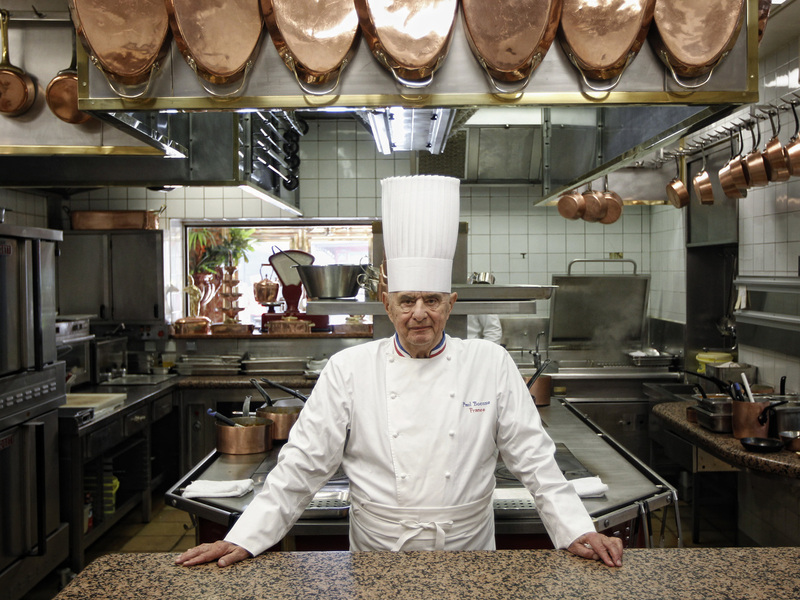 He said Bocuse "inspired me in 1975 to dedicate my life to what has been my great passion. My first visit to his restaurant changed my life." The world looks a little dimmer today. We lost one of the greats with the passing of Paul Bocuse, a vital link to our culinary heritage and the man who inspired me in 1975 to dedicate my life to what has been my great passion. Bocuse's flagship restaurant is the three-star L'Auberge du Pont de Collonges outside Lyon. The winter menu offers a famous chicken dish poached in a pig's bladder. The price: 250 Euros ($305). Another celebrated dish is V.G.E., a soup made from truffles, foie gras and mushrooms. The menu says it was "created for the French President." And it has a price to match of 87 Euros ($106) a bowl. Bocuse came up with the soup in 1975 for then-president Valéry Giscard d'Estaing. And Guillaume Gomez, head chef at the presidential residence, told BFM TV that the soup still served at the Élysée. A symbol of Bocuse's outsize status in the Lyon region can be seen in a towering mural depicting him with toque and chef's coat looming over a city street in Lyon. Born in 1926 near Lyon into a family of chefs, Bocuse's life centered around food and cooking from the start. At the age of 16, he entered an apprenticeship and by 1958 had won his first Michelin star at his family restaurant L'Auberge du Pont de Collonges. Despite becoming the international face of nouvelle cuisine, the Times reports, that as the style fell out of favor, Bocuse tried to disassociate himself from it. He once called the movement "a joke" and described it as "mini-portions on maxi-plates." Bocuse lived with Parkinson's disease and in recent years made preparations for his succession by placing relatives in "strategic positions" throughout France and the United States, reports Le Monde. "I work as if I will live a hundred years and I enjoy life as if each day was the last," Le Monde quoted Bocuse as saying. He would have turned 92 next month.